Eating L.A.: Trois Familia Review: Does French Technique Work With Mexican Flavors? Trois Familia Review: Does French Technique Work With Mexican Flavors? This review originally appeared in the Los Feliz Ledger. When French chef Ludo Lefebvre first started doing innovative pop-ups around town and then opened the tasting menu-focused Trois Mec and its little sister Petit Trois, he probably wasn’t thinking Mexican-French fusion. But the perpetually forward-thinking Frenchman and longtime Los Angeles resident doesn’t slow down for long, and so when the former Alegria location in a Silver Lake mini-mall came up for lease, he decided to honor the space’s roots in his own European way, with help from partners Vinny Dotolo and Jon Shook of Animal. 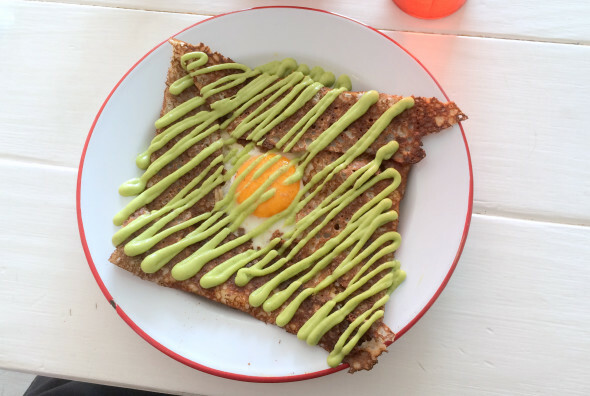 Trois Familia serves only breakfast/brunch/lunch in a much more casual atmosphere than their other restaurants, with colorfully painted walls, picnic table seating and no reservations. Silver Lake residents probably never knew they wanted French burritos or chorizo crepes, but now that they’ve got it, they’re plenty happy to put their name on a list and wait for a spot on the communal benches on the mini-mall sidewalk. Boho decor touches include succulent pots lining the walls and a turntable and records on a corner shelf. When a baby starts bouncing to a vintage punk song by the Slits, it’s hard not to be caught up in the festive ambiance. These are Mexican dishes filtered through Lefebvre’s lens of French technique, and they’re unlikely to be like any you’ve seen before. A beet “tartare” tostada is only nominally Mexican, though it rests on a perfectly crunchy and tender tortilla round and is topped with a delicate avocado creama that could be the snooty cousin to guacamole. It’s more akin to a Russian salad, with a light creamy dressing…and then, a hint of heat creeps up on you towards the end, gently nudging you to remember that you are in some kind of imaginary Mexican territory. That breakfast crepe filled with salty chorizo custom-blended by their meat supplier is topped with a perfectly-cooked egg and striped with more of the luscious avocado crema; the flavors somehow simultaneously evoke a creperie in Brittany and a quesadilla from the streets of Mexico City. If there’s a signature dish, it’s the hash brown chilaquiles. Crispy potatoes stand in for the traditional tortilla chips, while “salsa macho” gives the dish an acid jolt. There’s very little resemblance to the dish it’s named for, but it has its own terrific flavor. The only issue is that at $9.95, you’ll really want two, and then you’ve spent $20 for two eggs -- before even ordering the $5 cup of Heart coffee. I’ve never made it as far as the churro French toast, because as much as I love Salt & Straw ice cream, who needs it for breakfast? The menu changes frequently, so if anything made with the creamy, cheesy Anson Mills grits makes an appearance, snap it up. The only dish that slightly underwhelmed was the burrito, which didn’t quite add up to enough flavor as rustic beans overshadowed the delicate garlic brown butter. For something more filling, try the double decker potato tacos or chicken Milanesa. Fans of homey desserts will go wild for the tres leches birthday cake.There’s no alcohol, but there are a few decadent drinks like the house-made horchata, Nutella malted “iced hot chocolate” and an Abita root beer float. It’s pure Silver Lake of the moment -- so how much you will like Trois Familia will depend on how much you’re willing pay for breakfast, whether you miss Alegria and how happy you are to be eating in one of Ludo’s restaurants right in Silver Lake. It was an exciting prospect to have these guys on the East but I found this place profoundly underwhelming and way over-priced. A shame. Great review. i disagree with your previous commenter -- myself and whomever I've dragged there as loved every bite. Though, not being a millennial, I'd prefer more comfortable seating. A guy can dream, right?